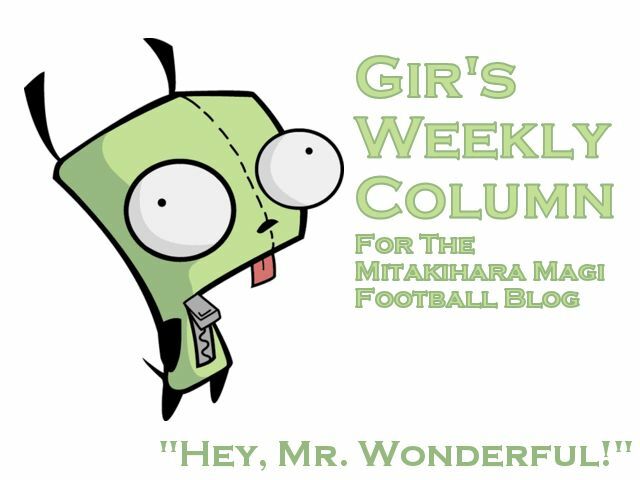 Hey guys, it's me, Gir Todafunk, with another Weekly Column for the Daily Magi and Magi Football Blog. I am currently listening to the strains of an old song from decades ago, "Beautiful World" by the late Hikaru Utada. I remembered that my father shook hands with Ms. Hikki when he was younger. Memories, memories. For the record, I can replicate the music at my private studio in my off-campus house. Yes, I now live off-campus with Nana and our daughter Hana. Being a dad and a student takes a lot. I kind of feel like I'm an NFL player or a professional athlete. I gotta do my best not to be broke. We have a local babysitter taking care of our little daughter, who I hope will grow up to be as adorable as my wife. Damn, it feels good to be a father. Aside from that, I want to talk about a few of the new players playing for Mitakihara. One of them is middle linebacker Roman Evans, who hails from Edmonton, Alberta. Woooo! E-Town in the house! I don't think we've ever had a player on this team come from Edmonton, so it's nice to see a Albertan on this team. From E-Town to M-Town, fabulous. Here's the scoop on Roman. He was choosing either us or Bowling Green or playing Canadian football for Alberta. Once Coach Kaname went over and offered Roman a scholarship, he jumped at the offer. So now he is the new starting middle linebacker, and his father, Robert Evans, is the owner of the West Edmonton Mall. How awesome is that. We got connections to all the famous people. We get a lot of new faces from the South. One of the top players we ended up getting was defensive tackle Brandon Sherman from Selma, North Carolina. His father owns the White Swan BBQ and is an ace at cooking the Carolinas style of barbecue. Brandon told me as we were practicing this week that he wants to be like his father, earn a degree in restaurant management, and take over the establishment when he finishes his pro career. That is a man with a plan and he's only a freshman. A lot can happen between now and graduation. Another player that I want to highlight in this column that is a new face is Charlie "Chaz" Thomas, a halfback from Vivian, Louisiana. His father, Bill Thomas, owns a Cajun restaurant called Cajun Tex, located in nearby Marshall. They have some interesting seafood, steaks, burgers, wings and of course, po-boys. At the restaurant, there are televisions that take a look at action from across the country. Even though that is LSU country, they do have room for us. Here in M-Town, Joe Crawford Jr., the son of former Magi punter Joe Crawford and an Mitakihara alum, owns Fin de Semaine, a Cajun restaurant and patisserie in Madoka Square that features some of the finest fare from Louisiana. I don't think it comes close to the food at Cajun Tex, but I would assume it comes close. Joe Jr., by the way, played on the rugby team as a wing. I'm going to feature a few more players in the next weekly column, but I'll stop here for now. Until next week, this is Gir, Mr. Wonderful, signing off. You are not alone.